Floral arrangements brighten up any space adding color and fragrance. Basic floral arrangements are made with line, filler and focal or mass flowers. The ten basic flower arrangements are constructed with shape and symmetry in mind. The pyramid, dome, oval, fan, vertical, triangle, L-shape, crescent, inverted crescent, horizontal and inverted T are the basic arrangement shapes. These basic arrangements are used for weddings, centerpieces, funeral and gift arrangements. Vases, pottery, ceramics, glass and metal containers are used for floral arrangements. Any item that will hold foam or water can be used for arranging flowers in. A teapot, aluminum can, washtub, even a boot can be used for a decorative flower bouquet holder. 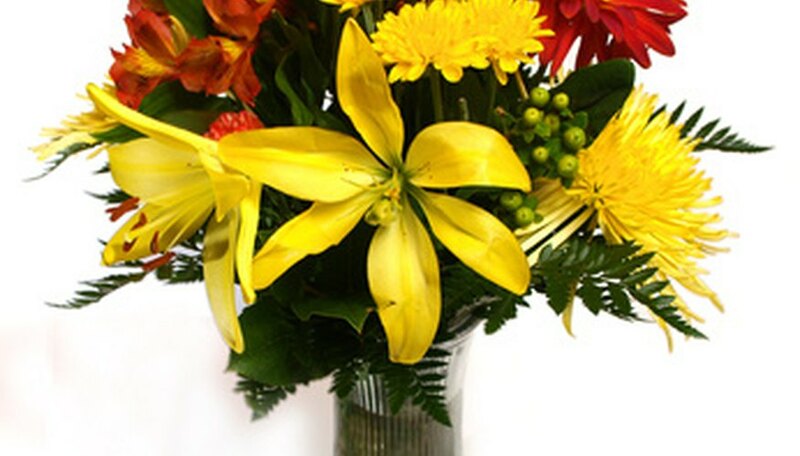 Novelty arrangements are more likely to be a free form, vertical, inverted T or triangular shape. Line or straight flower stalks are snapdragons, glads, delphinium and stock. Filler flowers like baby's breath, asters and are used to fill in large areas of the arrangement and give it a finishing touch. Mass or focal flowers are the highlights of an arrangement. Mass flowers are roses, tulips, orchids, iris or carnations. Arrangements will have a single type of flower or a combination of the three. Line or mass flowers form most of the shapes in the types of arrangements. The basic floral arrangements are constructed based on a shape. The dome is a rounded shape that is ideal for low table centerpieces. 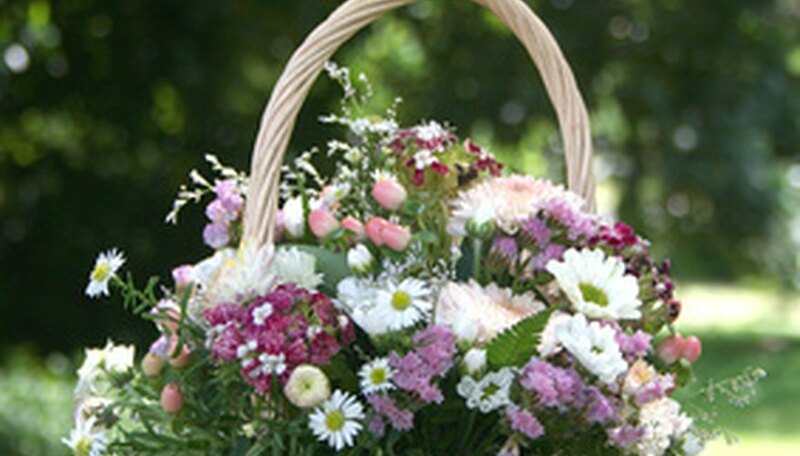 A fan-shaped arrangement fills a basket for a large wedding, church or funeral display. The horizontal shaped arrangement is low and two times longer than the height. Both sides of the centerpiece is as closely identical as possible to the other. Line or mass flowers form the L-shaped structure. A crescent shape works for a centerpiece while the inverted crescent is nice for a wedding candleabra design.